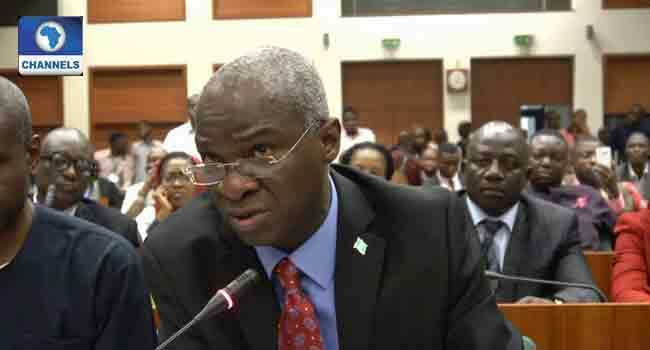 The Minister of Power Works and Housing, Babatunde Fashola has warned contractors handling various ongoing federal road projects across the country against indulging in substandard work to avoid having their contract revoked. The Minister issued the warning on Thursday when he inspected the Kaduna Eastern Bypass road project in Chikun local government area of the state being constructed by the federal government. While emphasising that the Ministry of Works is tired of entertaining contractors who promise to offer high-quality services but end up building substandard structures, Fashola reassured that the President Muhammadu Buhari’s administration is committed to improving infrastructure across the country. The contract for the construction of the Kaduna Eastern Bypass was awarded by the Former President Olusegun Obasanjo’s administration in 2002. The road when completed is expected to ease traffic in Kaduna metropolis and also to serve as a gateway between the Federal Capital Territory, Abuja, and the Northern States. The project initially awarded to an indigenous construction firm at the cost of N16million and was reviewed upwards to N38billion in 2017 due to modifications and cost of materials. The Minister accompanied by Kaduna State deputy governor, Bala Bantex visited the project site to inspect the progress of the project. He expressed satisfaction with the level of the work by the contractor but vowed not to compromise with the standard. Meanwhile, the Deputy Governor of Kaduna State, Bala Bantex said that the road project, when completed, will boost socio-economic activities in the area among other benefits. Fashola, however, noted that the Ministry of Works is currently constructing about 2,000 pilot scheme Housing Units in 33 States. According to him, beneficiaries of the houses will be low-income public servants in both private and public sectors.